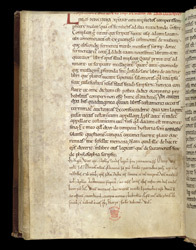 Medieval monasteries copied letters as a means of preserving records of privileges granted them or other actions which affected their status and also as records of theological discussions. This manuscript has some letters relating to churches in Worcester in the 11th and 12th centuries. The some of the letters are copied in the margins and blank spaces of an excerpt from Augustine's 'De Doctrina Christiana'. A copy of a letter written by Henry, bishop of Winchester and representative of the pope, to the prior and convent of St Mary's Church, Worcester, has an alarming message. He orders them to make good their overdue payment of a tax, 'Peter's pence', or else they would be interdicted, meaning they would not be able, for example, to receive the sacraments as usual or have public church services and funerals.